An obvious question that runs in any travelers mind about Hampi is the actual time required to explore Hampi in total. Most people, depending upon the period of vacation, number of places to be covered, purpose of visit, etc., decide the duration of travel which may vary from a few days to months. An elderly friend of ours was quite curious to know if we had explored Hampi completely and when he questioned us about the same, we replied with a smile and nodded our heads in a way that meant we hadn’t, and also affirmed him of doing it shortly. Long time back, we had read about one, Mr. Robert in a newspaper which stated about him as follows, “He quit his job in Dutch and came to India, traveled many places and finally settled at Hampi. 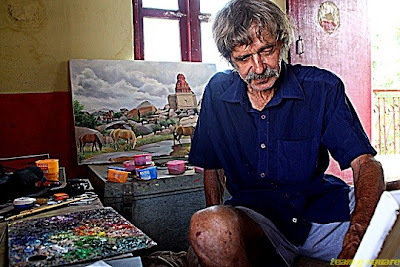 He has been a resident of Hampi and has been painting ever since”. Our search for him began when we stepped into Hampi. 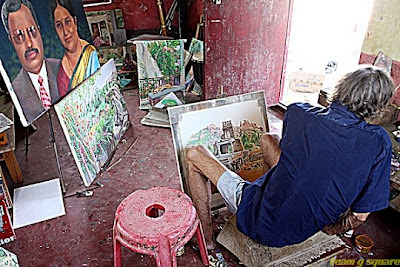 Having met him, seen the paintings and interacted with him about his passion for paintings about Hampi, we can say for sure that they truly are a reflection of the grandeur of Hampi and the life style of Lambani tradition. It is quite intriguing to know that Hampi has kept him motivated for a long period of 35 years and is still on. He says with pride that Hampi always has something new to offer him each day. Kudos to you from all of us Mr.Robert! After meeting Mr. Robert, it seems like Hampi is an ocean and any amount of exploration is just a drop in the ocean! wow! Nice to know about Mr Robert. He is truly passionate about Hampi! wow! it must have been quite an experience, meeting him. Interesting. The unspoken and unheard stories are best enjoyed. Thanks for sharing this. Great to met him in your blog. Wonderful! That must have been one inspirational experience to interact with him. Glad to see a bit of his work too. Wow..Kudos to Mr.Robert and to you too for presenting this info.. Very true. How much ever you explore there is still something that is not known to all.